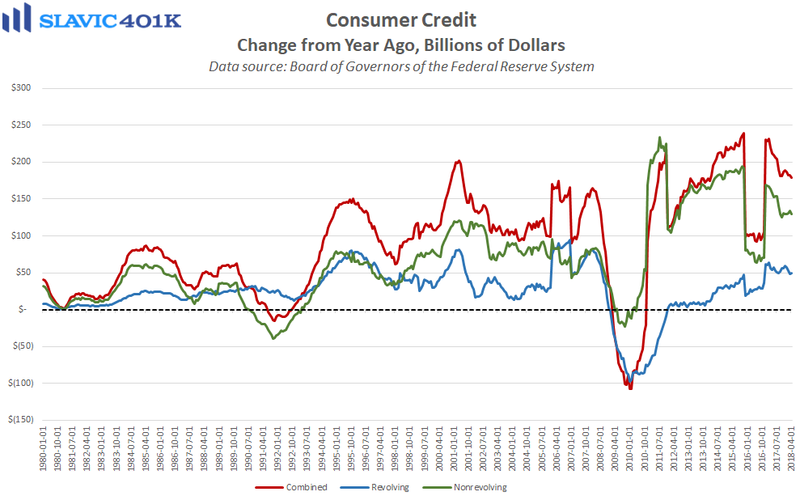 The latest report from the Federal Reserve Board of Governors (FRBG) on Americans’ borrowing activity showed that total U.S. consumer credit outstanding rose by $9.26 billion in April (lagged release) to $3,882.54 billion. That was the smallest monthly increase since September and significantly worse than economists had expected. Non-revolving credit (student and automobile loans) rose by $7.00 billion in April, and revolving credit, which is mostly consumers’ credit cards, lifted by $2.26 billion. The revolving credit gain is a welcome turnaround from March’s $1.10 billion decline and could suggest that the Q1 weakness in credit card use was just a healthy pullback following a strong holiday shopping season. However, the April gain was well below the 2017 average ($4.93 billion), and the longer-term trends in both revolving and non-revolving credit growth have clearly softened over the past few years. Further, the latest Senior Loan Officer Opinion Survey (SLOOS) from the FRBG showed that banks have seen weaker demand across all major lending categories this year. That could be related to recent and expected monetary policy (rising interest rates), as some banks have already started to tighten their lending standards, albeit slightly, in the multifamily, automobile, and credit card arenas. Going forward, though, such headwinds could be offset if the economic environment remains supportive of credit growth, e.g. continued gains in wages and consumer confidence.